A total 36.3 million watch on the major networks. 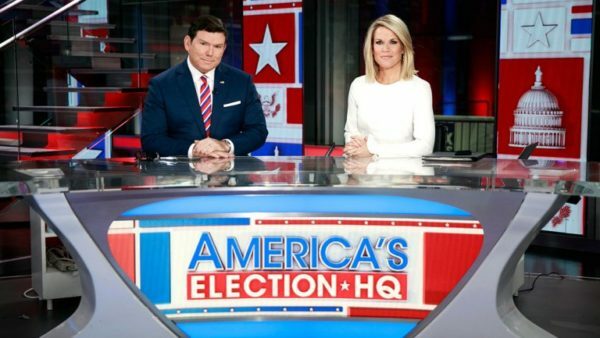 Tune-in for Tuesday night’s election returns was up by significant margins from the last midterm, with cable news viewership alone up a strong 64 percent from 2014. Looking at primetime coverage, between the hours of 8 p.m. and 11 p.m. ET when so many races were called, a total 36.3 million viewers were watching across the six major networks carrying breaking news. Among the lot, which included Fox News Channel, CNN, MSNBC and broadcasters ABC, NBC and CBS, Fox News performed the best among total viewers. CNN managed a narrow win among adults 25-54, topping even the broadcast networks in its showing among the news demo. Press materials for NBC News are claiming a victory on Wednesday morning for its shared coverage on two networks, MSNBC and NBC, but Fox News was the outright victor among single networks with its average 7.8 million viewers for the three-hour primetime block. NBC was the closest individual to trail, though by more than 2 million viewers. CBS: 3.9 million viewers; 1.3 million adults 25-54Comparing Tuesday’s numbers to the most recent election would be misleading, given the fevered interest in every presidential showdown, but the total audience across traditional TV reflects a significant boost from typical off-year elections.